Eat your weeds. No really, eat them. I ate a salad tonight that I haven’t eaten in quite some time, but one that I adore, crave, and remember fondly from my childhood. My Dad collected dandelion greens today – young, tender, small leaves that, yes, are weeds, and yes, surround those beautiful bright balls of yellow sunshine…dandelions (which oddly brings to mind that old playground ritual of “your momma had a baby and it’s head popped off” – anyone else remember that?). They are commercially available, but plentiful in yards all over the country – just be sure to wash them very well. These weeds, that are now ‘gourmet’ in contemporary gastronomy, are typically called ‘dandelion greens’ but also referred to as ‘chicory.’ The Italians know this sought-after specialty as cicoria! The mere sound of that word in my house takes me back to countless summers, when this salad would accompany grilled meats and fried steaks. I’m not going to lie, they are bitter…but that nutty, peppery bitterness that make radicchio and arugula so damn special. I personally love the taste, and my family’s preparation cuts the bitterness with sweet, acidic flavors. So, here’s how I learned how to prepare “cicoria” from my parents…not really a recipe, because it is a subjective taste…add a little of the below, taste, and cater to your palate. First and foremost, you have to boil some eggs. I would say four to five eggs. Allow them to cool. In a large salad bowl, filled with cicoria, add a few splashes of your favorite white balsamic or red wine vinegar. Sprinkle some sugar, and lightly salt. Drizzle some extra-virgin olive oil. Slice or chop the boiled eggs, and add to the salad. Mix well – the boiled yolks mix with the vinegar and oil and the whole thing just instantly makes a creamy and sweet dressing. I also like adding thinly sliced shallot, if available, shaved Parmiggiano Reggiano, and the optional addition of freshly ground black pepper. And if the taste doesn’t sell you, dandelion greens are known for their exceptional nutritional value. High in vitamins A, B complex, C and D, these greens are also rich in iron, potassium, magnesium, calcium and zinc. My Mother would always say, “Mangia a cicoria! Ti pulisce uu sangue!” (Eat the cicory! It cleans your blood!). 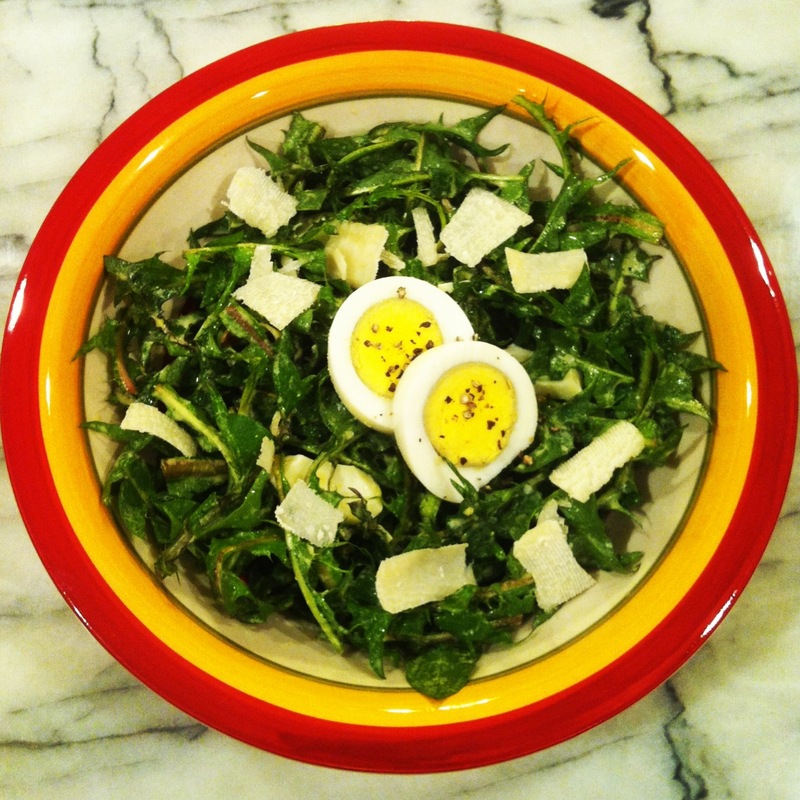 As a natural diuretic, dandelion greens are an excellent vehicle for detox. I guess Mom’s are always right. So get out there, grab the kids, start picking, and add this unique, delicious, and nutritious salad to your ‘start of summer’ meals. Buon Apetito! I love dandelion greens. Many think they are too bitter…but, I love them. Great post!